Happy Friday Friends! I am so excited for this weekend because my one of my very best friends from college is coming to visit! I haven’t seen here since Phil & I went to visit for Rockaway St. Patty’s Day in March and it feels like forever! In honor of her visit, I am highlighting some more fiesta food, since whenever Michelle is in town, you know its a party! I made roasted garlic hummus & pita chips as part of the appetizer selection for my BBQ – this nutritious crowd favorite has become my go to for parties, quick snacking & an easy sandwich spread! Start by popping your garlic in the oven, wrapped in tin foil @ 450 for about 20 minutes…you’ll smell when its done! While the garlic cools, grab your food processor and combine the lemon juice & tahini. Allow these two ingredients to whip until they become a paste before adding your roasted garlic (just chop the top and squeeze it out), chickpeas (liquid from the can and all), & seasonings. Allow it all to run in the food processor for a few minutes (stopping to scrape the sides every now and again), and then set in the fridge while you crisp up your chips. Cut pita bread into triangles, toss in a large bowl with 1 tablespoon of EVOO and salt, line a baking sheet with the triangles & bake @ 450 for about 5-10 minutes until they’re nice and browned. Remove triangles from baking sheet & cool on a rack. 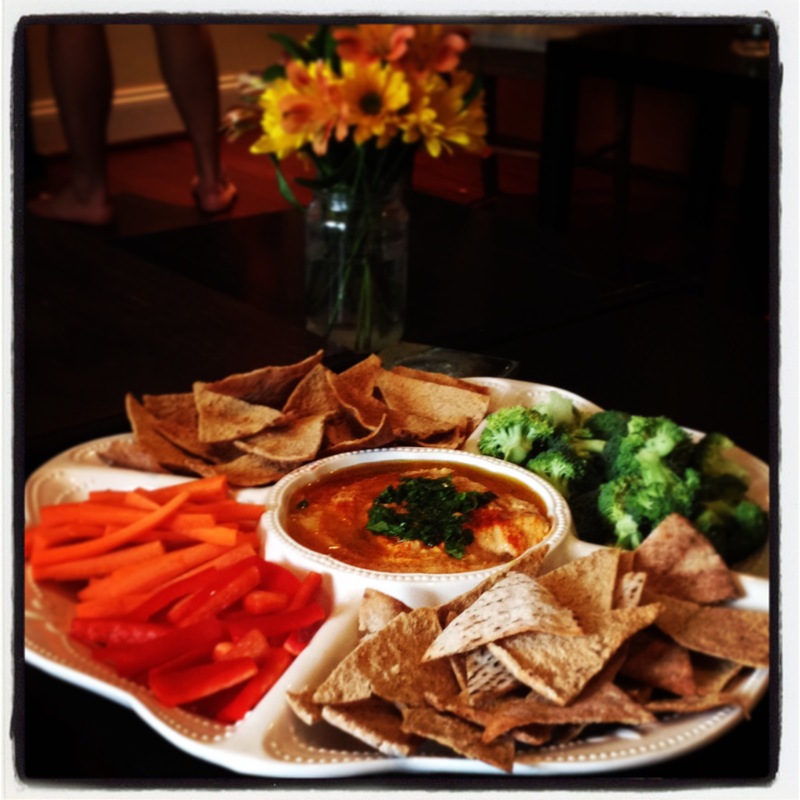 While the chips crisp spoon your hummus into a serving dish, top with remaining EVOO & chopped parsley & you’re all set! I love adding colorful vegetables to the plate to add color and nutritional value but the hummus & chips are delicious all on their own! Pose-A-Day: Did some late night yoga & got my Adho Mukha Svanasana (Downward Facing Dog) shot from a very interesting angle. Since I am already dancing for joy today’s Natarajasana (dancer) pose should be a fun one…officially half way there!!! Have a wonderful weekend wordpress family!